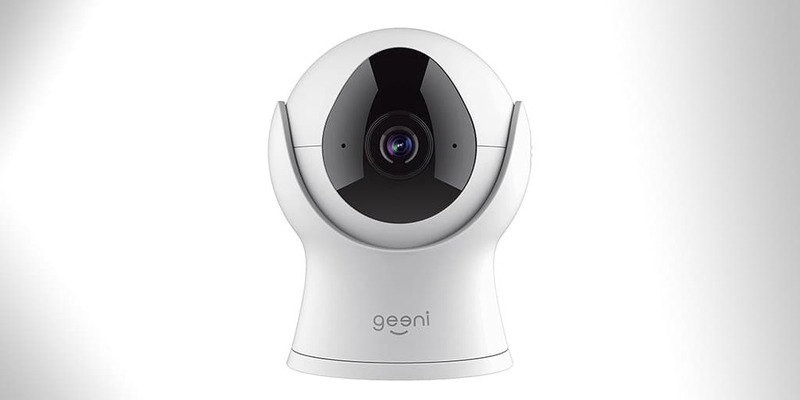 Geeni Vision Smart Wi-Fi Security Camera Review | Nerd Much? With so many options available for your home security needs, picking the right one can become a daunting task. The real question you have to ask yourself when shopping around is: why? Basically, why are you getting a home security camera? That might seem like an obvious statement, but when it comes to choosing the right one, it all comes down to bang for your buck. In other words, you could very well be spending more money on features that you might not need or don’t care about. And in our effort to deck our house out with cheap smart home tech that actually does the job, we’re always on the hunt to find the sweet spot between price and functionality. Where the Geeni Vision Smart Wi-Fi Security Camera fits into the equation is somewhere on the lower end of the spectrum — you don’t want to spend an arm and a leg, but you also don’t need a feature-heavy smart cam. This security camera sports 720P HD vision, and it allows users to see what’s going on in their home at all-times, whenever they want to check things out. It syncs with the Geeni app (which is the same app all Geeni lights use as well), and that means that it also has synergy with Amazon Alexa. Setup for the Vision is a breeze, and the step by step guide was easy to follow, without any hiccups. In less than a minute, I had the Vision camera setup and running, able to view the Nerd Much? mascot, our corgi named Watson, in the app on my phone. As far as the physical appearance of the device itself is concerned, it has a sort of eye-inspired look to it — as if it’s meant to insinuate that it’s going to keep an eye on things for you while you’re away. It’s available in both black and white as well, so there are at least a couple of different options. The camera is housed in a spherical bit of hard plastic that’s slightly smaller than a standard rubber ball, and it sits on a base that allows you to swivel to camera’s eye up or down. Its size makes it a great option for a bookshelf or desk, as it’s not much bigger than the palm of your hand, and its general aesthetic pairs well with the rest of today’s technology (read: it doesn’t feel out of place). Unfortunately, you can’t control where the camera points remotely, so you have to make sure you have it pointed correctly in the right direction before leaving the house. But the video quality you are getting is clear, and if you have it properly aimed in a room you want to monitor (like a playroom, for instance), you’ll be able to see what’s going on without any issue. You’re also able to record footage from the camera and save it onto your phone’s memory remotely or you can save it onto a microSD card right on the camera, itself. You can set up your camera to send alerts to your phone when there is any motion or noise around the camera, allowing you to see what’s happening when it happens. It’s easy to setup, and as you only need to tap a switch right in the Geeni app. The sound quality of the speaker isn’t all that great, as it lacks the majority of the lower end of the sound spectrum; bassy voices are virtually non-existence. It picks up mid to higher vocal ranges with clarity, but again, it completely misses the low end. Luckily, you’re likely not buying the Vision to host a remote singalong, so if you’re okay with lower sound quality in exchange for a lower pricetag than your other options, it’s a good option. At the $69.99 MSRP that the Geeni Vision is currently at, you’re getting a great option if you just want to keep an eye on things at home while you’re away. Whether you want to say hello to the dog while you’re out running errands or you want to keep an eye on the playroom without having to hover around your kids all afternoon, you’ll find what you need in the Vision camera. For more ridiculously cool stuff, stay tuned to Nerdmuch.com.